This fantastic Marleaux Votan was hand picked by us at the recent 2014 Musikmesse in Frankfurt. We just played it for a minute and we were hooked! Gerald Marleaux has been making amazing 100% handmade basses for years from his shop in Clasthall-Zellerfeld (Germany). These are original designs with a personal touch. However, the Votan model (named after some German mythology) is designed taking as a reference some really classic bass designs as Marleaux wanted to add such type of bass to his offer of instruments. Of course the classic design is just the beginning. The ergonomics, comfort, sound and versatility departments have been really taken care of and the result is an instrument that simply offers the best of both worlds. The response, dynamics and sounds are simply amazing. This bass is alive! The lightweight one piece dibetou body is the perfect base for a great instrument. The bolt on neck keeps all the natural attack intact but of course access to the upper frets has been improved over classic designs. One of our favourite features of the Votan is the 100% familiar feel when you grab it. Some other bass desings are really nice to look at, but when you put it on yur lap or use a strap you feel that the right forearm starts to suffer after a while or the neck seems to place itself a bit too far from you. These little aspects make all the difference when you play an instrument for a long period of time and it is something we cannot stress the importance of enough. The 34" scale, 18mm spacing and 42mm nut all make it extremely familiar feeling. The solid ETS bridge lets you adjust height, intonation and even string spacing easily. With perfect ergonomics and great looks, of course you will like to know what it sounds like. Don't worry, Gerald Marleaux did his homework in this department too! The two oval Delano pickups are based on this brand's X-Tender units, but have been modified to match Marleaux' own tastes (Gerald Marleaux is a great bass player and that makes all the difference, honestly). There are two 3 way miniswitches, one per pickup and these let you choose Single Coil-Parallel-Series mode from each. Sure, you will spend a couple of days trying different sounds but the good news is that all of them are 100% musical and useable, which is not always the case with basses with multiple switching options. Marleaux' own excellent active preamp is used on this bass, although it sounds awesome in passive. In passive mode you get Volume, Balance and Passive tone, and in active mode you have Bass and Treble (Boost/Cut). 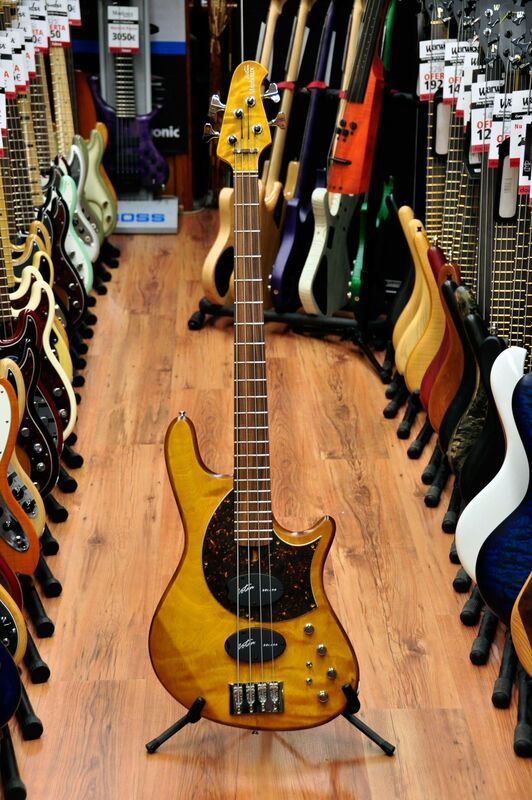 Not many basses can offer convincing sounds from Miller, Pastorius, Flea, Prestia, etc. Well the Marleaux Votan is one of these.